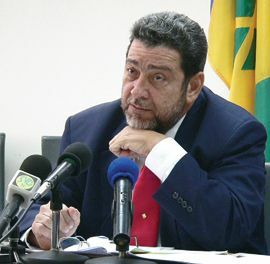 Saying that he was hurt, deeply so, by the course of action taken by the St Vincent and the Grenadines Teachersâ Union in protest over the results of the reclassification process, Prime Minister Dr Ralph Gonsalves suggested that he was willing to put his political future in the hands of people, specifically those in the various divisions of the public service. âI love what I am doing, I want to say I do not have a desire to leave what I am doing, at the same time…I do not want to be here and betray those whom I love,â Dr Gonsalves said in a press conference yesterday morning. He called on citizens to write letters, call in on radio programmes, and use other media to express their opinions, which he will then assess in making his decision. Dr Gonsalves said that he believes that he, more than any other Prime Minister has done a lot to transform the educational system, and give more benefits to teachers, hence his sadness over suggestion that he has betrayed them in the reclassification process. Flanked by most of his cabinet colleagues, a visibly distraught Dr Gonsalves said that he was disappointed that the teachers chose to take a confrontational approach to the situation, rather than exhausting all channels of dialogue, including the appellate mechanism that has been put in place. He further stated that while the appellate body has guidelines, the body also has a large degree of flexibility when dealing with the various issues that may come before it. Dr Gonsalves also used the opportunity to correct a statement made by Minister Michael Browne, when he said that Teachersâ Union president Joy Matthews had promised Dr Gonsalves that no strike action will be taken until he returns from his six-day European trip. âI said to her…I want to tell you that I am dissatisfied with the manner in which the union is proceeding with this issue. I said I am not at war with the unions or the teachers…the questions on which there may be differences canât be resolved by this telephone call… please do me one thing, do not have a strike when I am away, she said, âI hear youâ,â Dr Gonsalves explained. âThe Honourable Minister Mike Browne was in error when he said in his speech that she gave an assurance,â Dr Gonsalves clarified. Dr Gonsalves said that the actions taken by the teachers set a bad precedent to students; in that they are led to believe that at the first sign of difficulty, instead of working things out, striking is the course of action. He suggested that for students, this can transfer into dealing with other situations, where the striking is not referring to industrial action but physical violence. The Prime Minister read excerpts from a report given to him by the Special Branch of the Police Force, which showed instances where he was verbally attacked and insulted at the recent general meeting of the teachersâ union. channels of dialogue, including the appellate mechanism that has been put in place.